Win: HD kit and 5 Days Of War! From director Renny Harlin (Die Hard 2, Cutthroat Island) and inspired by recent true events, 5 Days Of War is the brutal and bloody truth behind the 2008 conflict between Georgia and Russia in South Ossetia. With an all star cast including Rupert Friend, Emmanuelle Chriqui, Andy Garcia and Val Kilmer, 5 Days Of War is an epic tale of strength, courage and humanity. 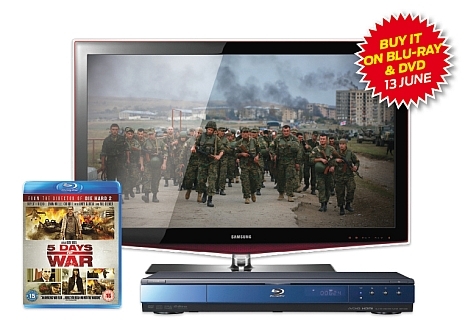 To celebrate the film’s release, we’ve teamed up with distributor Entertainment One to give away a fantastic 40-inch hi-def TV, Blu ray player and copy of 5 Days Of War on Blu-ray – enough to keep any dad happy this Father’s Day! Ten runners up will also win a copy of the film on Blu-ray. To be in with a chance of winning, CLICK THIS LINK and answer a simple question.